Super Savings Item! 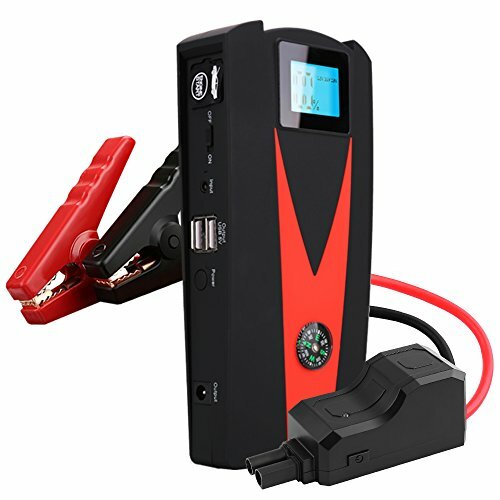 Save 34% on the Car Jump Starter, 12V 800A Peak(Up to 5.0L Gas or 4.0L Diesel Engine) Portable Auto Battery Booster,Dual USB Power Bank Phone Battery Pack Built-in LED Light & Compass by PUSHIDUN at Lazaranda Dallas. MPN: KK08S. Hurry! Limited time offer. Offer valid only while supplies last. Order with Free Shipping from Dallas【Powerful & Life Saver】 Enough power to boost most vehicles (Up to 5.0L Gas or 4.0L Diesel Engine) on the road! Works with vehicles, motorbikes, watercrafts, ATVs, UTVs, and snowmobiles. 【Advanced Safety Technology】The smart jump clamp features more than 8 advanced safety technologies including Reverse charge protection,Short circuit protection,Over temperature protection,Reverse polarity protection,Over discharge protection,Over charge protection,Reverse connection protection,Over current protection.With harsh quality check, never worry about cracking or catching on fire. 【Power Bank with Dual USB Ports】15000mAh Jump starter is equipped with two USB ports, which can charge two devices simultaneously for many times.The output power is up to 5V/2.1A. There are two adapters in the case,which will makes it easier to charge at home or on the road. 【Additional Functions】The LED light has three modes with Flash light, Strobe light and SOS light. It can help you In any case especially for adventure, outdoor, daily, emergency, travel, high and low temperature(-4℉~140℉).The LCD screen can exactly show the jump starter's working status. The compass can help you find your way home when getting lost in the wild. 【NO-Worries】When choosing our jump starter kit, you will have our 12 mouths after-sale warranty with friendly and professional technical support. Questions will be respond within 24 hours. If you have any questions about this product by PUSHIDUN, contact us by completing and submitting the form below. If you are looking for a specif part number, please include it with your message.